A whimsical place to play, where paper and ink become one. Today I come to you with a new project. This is a 5x7 piece that I plan to frame. Christopher was born on Thanksgiving day, November 28th. 2013 at only a mere 23 weeks gestation. At 12" long and a little over a pound in weight he held on for 10 beautiful days, giving his family time to be with him. 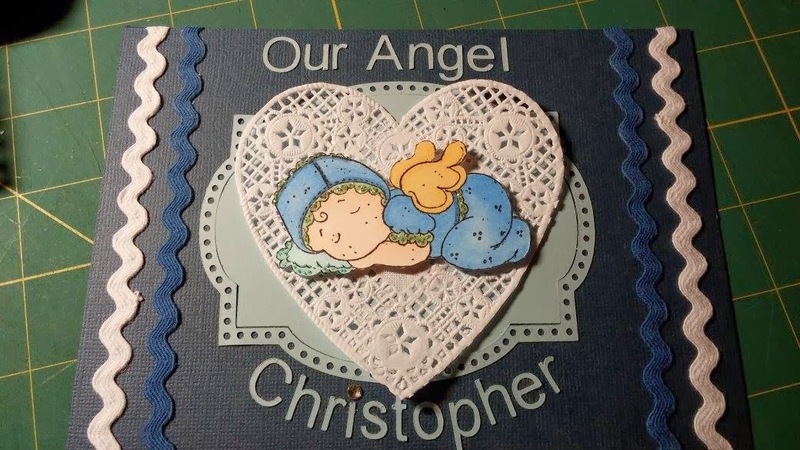 Christopher lost his battle on December 8th, 2013. He may be in heaven now, but he will always be an angel watching over our family. I made this in memory of our Angel. May the family involved feel peace and love each and every time they see this. I just completed my Graduation Announcements. I have been in school for 3 years and will be graduating in 2 weeks and 6 days! YES I am counting the days down...It has been a long road but I am proud of my accomplishments. This grad card is quite simple but classy at the same time. The top and bottom of the card are heat embossed black on black. I used Stampin Ip Black and Eggplant card stock and one of their scollop edge punches. The inside of the card just announces my achievement. The school class is so large that we are unable to invite people. We each only receive 4 tickets. :-( So I decided on an announcement rather than an invitation. Mu Second Card Colored with Alcohol Markers. Here is card #2 from Saturdays Scrap. 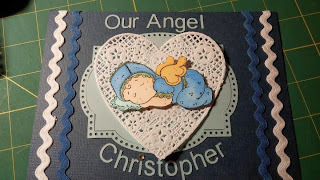 With this card I combined the use of a Magnolia Stamped Image with a Stampin Up! set with the topiary and sentiment. I think it really came out cute. Everyone at the event just loved these and asked me lot of questions about the markers and stamps. They couldn't believe it was the very first day of coloring with the alcohol markers. 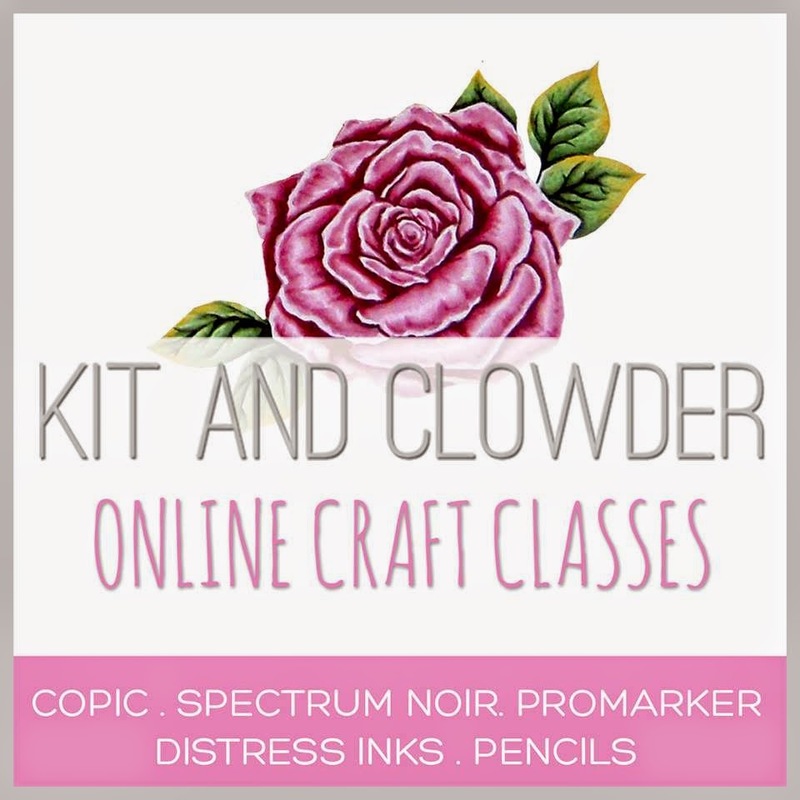 This past couple of weeks I have been introduced to some awesome Magnolia stamps as well as Copic and Spectrum Noir Alcohol Based Markers. The above card is my very first attempt at using both. After working with such a limited amount of colors I already realize that I am needing more! Tilda is blowing wishes in this stamped image which is just absolutely adorable. I thought it would make a wonderful birthday card.